The communist movement, which made a big fanfare for over a century, has brought mankind only war, poverty, brutality, and dictatorship. With the collapse of the Soviet Union and the Eastern European communist parties, this disastrous and outrageous drama finally entered its last stage at the end of the last century. No one, from the ordinary citizens to the general secretary of the CCP, believes in the myth of communism any more. The communist regime came into being due to neither the “mandate of Heaven” nor democratic election. Today, with its ideology destroyed, the legitimacy of its reign is facing an unprecedented challenge. The Chinese Communist Party (CCP) is unwilling to leave the historical stage in accordance with the current of history. Instead, it is using the ruthless methods developed during decades of political campaigns to renew its crazed struggle for legitimacy and to revive its dead mandate. The CCP’s policies of reform and opening up disguise a desperate intention to maintain its group interest and totalitarian rule. Despite tight restrictions, the economic achievements earned by the hard work of the Chinese people in the past 20 years did not persuade the CCP to put down its butcher knife. Instead, the CCP stole these achievements and used them to validate its rule, making its consistently unprincipled behavior more deceptive and misleading. In this historical moment today, it is especially important for us to understand clearly why the CCP acts like a band of scoundrels and to expose its villainous nature, so that the Chinese nation can achieve lasting stability and peace, enter an era free of the CCP as soon as possible, and construct a future of renewed national splendor. Throughout history, whenever the CCP encountered crises, it would demonstrate some traces of improvement, enticing people to develop illusions about the CCP. Without exception, the illusions were shattered time and again. Today, the CCP has pursued short-term benefits and in doing so has produced a show of economic prosperity that has once again persuaded the people to believe in fantasies about the CCP. However, the fundamental conflicts between the interests of the CCP and those of the nation and the people determine that this false prosperity will not last. The “reform” the CCP has promised has one purpose—to maintain its rule. It is a lame reform, a change in surface but not in substance. Underneath the lopsided development lies a great social crisis. Once the crisis breaks out, the nation and the people will suffer once again. The ‘reform’ the CCP has promised has one purpose—to maintain its rule. With the change of leadership, the new generation of CCP leaders had no part in the communist revolution, and therefore have less and less prestige and credibility in managing the nation. Amidst the crisis of its legitimacy, the CCP’s protection of the Party’s interests has increasingly become the basic guarantee for maintaining the interests of individuals within the CCP. The CCP’s nature is selfish. It knows no restraint. To hope such a Party might devote itself to developing the country peacefully is wishful thinking. People don’t necessarily understand what the “center” and “basic points” stand for, but everyone knows that the communist specter’s determination to maintain its collective interest and dictatorship never changes. Communism has been defeated globally and is doomed to become more and more moribund. Nevertheless, the more corrupt a thing becomes, the more destructive it becomes during its dying struggle. To discuss democratic improvements with the Communist Party is like asking a tiger to change its skin. In reality, the CCP’s all-pervasive political control has so deeply branded the current Chinese culture and shaped the mindset of the Chinese people that even the criteria with which the Chinese people judge the CCP have the mark of the CCP, or have even come from the CCP. If in the past, the CCP controlled people by instilling its elements into them, then the CCP has now come to harvest what it sowed, since those things instilled in people’s minds have been digested and absorbed into their very cells. People think according to the CCP’s logic and put themselves in the CCP’s shoes in judging right and wrong. About the ban on free speech, some people are saying, “If I were the CCP, I would do the same.” Truth and conscience have vanished, leaving only the CCP’s logic. This has been one of the vilest and most ruthless methods used by the CCP due to its unscrupulous nature. As long as the moral toxins instilled by the CCP remain in the people’s minds, the CCP can continue to gain energy to sustain its iniquitous life. In reality, with its several million troops and armed police, the CCP is the real source of turmoil. Ordinary citizens have neither the cause nor the capability to initiate turmoil. Only the regressive CCP would be so reckless as to bring the country into turmoil at any hint of change. “Stability overrides everything else” and “Nipping the buds of all unstable elements”—these slogans have become the theoretical basis for the CCP to suppress people. Who is the biggest cause of instability in China? Is it not the CCP, who specializes in tyranny? The CCP instigates turmoil, and then in turn uses the chaos it creates to coerce the people. This is a common action of all villains. The launching of China’s spaceship Shenzhou-V was accomplished by the professionals of astronautic science and technology, but the CCP used it as evidence to prove that only the CCP could lead the Chinese people to enter the rank of powerful countries in the world. As for China’s hosting of the 2008 Olympic Games, what was in reality an “olive branch” given by Western countries to encourage China to improve its human rights, the CCP uses the games to enhance its claims to legitimacy and to provide a pretext for suppressing the Chinese people. China’s “great market potential,” which is sought after by foreign investors, stems from the capacity for consumption of China’s population of 1.3 billion. The CCP usurps credit for this potential, and turns it into a keen weapon used to coerce Western societies into cooperating with the CCP’s rule. The CCP attributes anything bad to reactionary forces and the ulterior motives of individuals, while crediting everything good to the Party leadership. The CCP will make use of every single achievement to make its claim to legitimacy more attractive. Even the wrongdoing that the CCP commits can be turned into something “good” to serve its purposes. Many non-communist countries achieved faster economic growth a long time ago. For example, when the truth about the rampant spread of AIDS could no longer be covered up, the CCP suddenly created a new identity. It carefully mobilized its propaganda machine, utilizing everyone from well-known actors to the Party’s general secretary, in order to portray the prime culprit, the CCP, as a blessing for patients, a destroyer of AIDS, and a challenger to disease. In dealing with such a serious life-and-death issue, all the CCP could think of was how to use the issue to glorify itself. 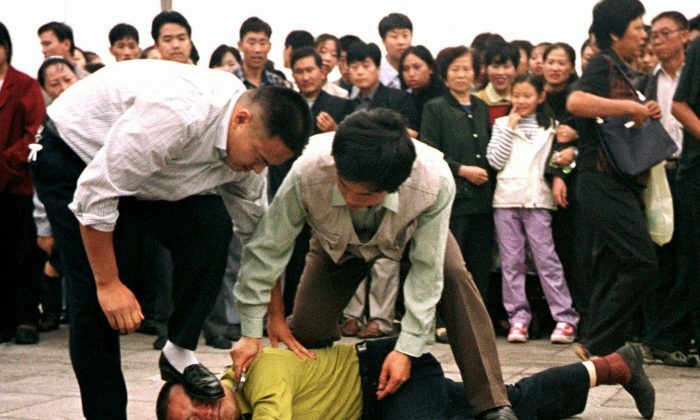 Only a schemer as vicious as the CCP is capable of such ruthless behavior as brazenly or underhandedly taking credit while utterly disregarding human life. The concept of “curse of the latecomer,” or “latecomer advantage” as some other scholars call it, refers to the fact that underdeveloped countries, which set out late for development, can imitate the developed countries in positive or negative ways. The imitation can take two forms: imitating the social system or imitating the technological and industrial models. Imitating a social system is usually difficult, since the necessary reforms would endanger the vested interests of some social or political groups. Thus, underdeveloped countries are inclined to imitate developed countries’ technologies. Although technological imitation can generate short-term economic growth, it may result in many hidden risks or even failure in long-term development. A considerable portion of China’s GDP is achieved by sacrificing the opportunities of future generations. It is precisely the “curse of the latecomer,” a path to failure, that the CCP has followed. Over the past two decades, China’s “technological imitation” has led to some achievements, which have been taken by the CCP for its own advantage in order to prove its legitimacy and continue to resist political reform that would undermine the CCP’s own interests. Thus, the long-term interests of the nation have been sacrificed. While the CCP constantly brags about its economic advancement, in reality China’s economy today ranks lower in the world than in previous times. During the reign of Qianlong (1711–1799) in the Qing Dynasty, China’s GDP accounted for 51 percent of the world’s total. When Dr. Sun Yat-sen founded the Republic of China (KMT period) in 1911, China’s GDP accounted for 27 percent of the world’s total. By 1923, the percentage dropped, but still was as high as 12 percent. In 1949, when the CCP took control, the percentage was 5.7. But in 2003, China’s GDP was less than 4 percent of the world’s total. In contrast to the economic decline during the KMT period that was caused by several decades of war, the continuing economic decline during the CCP’s reign occurred during peaceful times. Today, in order to legitimize its power, the CCP is eager for quick successes and instant benefits. The crippled economic reform that the CCP launched to safeguard its interests has cost the country dearly. The rapid economic growth in the past 20 years is, to a large extent, built on the excessive use or even waste of resources, and has been gained at the cost of environmental destruction. A considerable portion of China’s GDP is achieved by sacrificing the opportunities of future generations. In 2003, China contributed less than 4 percent to the world economy, but its consumption of steel, cement, and other materials amounted to one-third of the total global consumption. From the 1980s to the end of the 1990s, desertification in China increased from a little over 1,000 to 2,460 square kilometers (386 to 950 square miles). The per capita arable land also decreased from about 2 mu (1 mu equals approximately .16 acres) in 1980 to 1.43 mu in 2003. The widespread upsurge of land enclosure for development has led China to lose 100 million mu of arable land in just a few years’ time. However, only 43 percent of the confiscated land is actually used. Currently, the total amount of wastewater discharge is 43.95 billion tons, exceeding the environmental capacity by 82 percent. In the seven major river systems, 40.9 percent of the water is not suitable for drinking by humans or livestock. Seventy-five percent of the lakes are so polluted as to produce various degrees of eutrophication. The conflicts between man and nature in China have never been as intense as they are today. Neither China nor the world can withstand such unhealthy growth. Deluded by the superficial splendor of high-rises and mansions, people are unaware of the impending ecological crisis. Once the time comes for nature to exact its toll on human beings, however, it will bring disastrous consequences to the Chinese nation. In comparison, since abandoning communism, Russia has carried out economic and political reforms at the same time. After experiencing a short period of agony, it has embarked on a rapid development. From 1999 to 2003, Russia’s GDP increased by a total of 29.9 percent. The living standard of its residents has significantly improved. The Western business circles have begun not only to discuss the “Russian economic phenomenon,” but have also begun to invest in Russia, the new hotspot, on a large scale. Russia’s ranking among the most attractive nations for investment has jumped from 17th in 2002 to 8th in 2003, becoming one of the world’s top 10 most popular nations for investment for the first time. Even India, a country that, in the view of most Chinese, is poverty-stricken and full of ethnic conflict, has enjoyed a significantly expedited development and has achieved an economic growth rate of 7 to 8 percent per year since its economic reforms in 1991. India has a relatively complete legal system and a market economy, a healthy financial system, a well-developed democratic system, and a stable public order. The international community has recognized India’s great development potential. On the other hand, the CCP only engages in economic reform without political reform. The false appearance of an economy that flourishes in the short run has hindered the natural evolution of social systems. This incomplete reform has caused an increasing imbalance in the Chinese society and sharpened social conflicts. The financial gains achieved by the people are not protected by a stable social system. Furthermore, in the process of privatizing the state-owned properties, the CCP’s power-holders have utilized their positions to fill their own pockets. Xinhua News Agency report (March 4, 2004). Xinhua News Agency report (Feb. 29, 2004).